The HDx35 is an optical adapter that allows you to use B4 lenses, which were originally designed for the 2/3″ HD format, on a PL-Mount camera. The HDx35 is one of those products that looks really good on paper, and gets your creative juices flowing; “hey, I can get a 10x zoom on my ALEXA and stick it on my shoulder, and basically use it like an ENG camera. Or I get the equivalent of a 24-290 Optimo on my Alexa for a tiny fraction of the cost.” Hello, documentary shooting, here we come. From the ArriDigital website, a picture showing the HDx35 in action. I did this test to see how practical the adapter is to use in real-world situations, and what are the compromises and tradeoffs we face by putting another piece of glass between the lens and the camera…similarly, I wanted to get a feel for the adapter so I can decide whether or not to recommend it to my clients, and to find out what shooting situations would call for it. How many stops light loss? What is the translation of focal lengths? What is the translation of depth-of-field? Is it practical to put an Alexa with a zoom on your shoulder? Does it give a sharp image edge-to-edge? Broadcast lenses are available in high zoom ratios with wide apertures in a relatively compact size, making them a desired option for many large-sensor camera users. Designed and built by IB/E Optics for AbelCine, HDx Optical Adapters mount between a B4-mount 2/3” lens and a large sensor camera, expanding the projected light to cover the image area. The HDx Optical Adapter turns the B4 lens into a longer focal length lens, so that the relative depth of field expected for the larger sensor is achieved, while the usual field of view when the lens is mounted to a 2/3” camera is maintained. All HDx Optical Adapters also optically correct for the different spectral alignments between three-chip prism block sensors, for which the B4-mount lenses were designed, and the single sensor of the large sensor cameras. HDx Optical Adapters are highly telecentric in design, delivering a bright, sharp image across the entire frame, with excellent color and contrast. I used a bright hallway with windows on both sides, but which had a very dark doorway at the far end. The total exposure range was more than 11 stops. I put several chairs lined up in front of the camera so I could see very clearly what was happening with depth of field. The baseline for exposure was the Fuji HD zoom — with the doubler engaged, it was obviously going to be the darkest of all the lenses. The Fuji stills were taken without any ND in front of the lens. The DigiZoom stills were shot with a .3 ND filter in front of the lens to approximate the light loss of the doubler on the Fuji. The Prime lenses were shot with 1.2 ND in front of the lens – theoretically, then, they were four stops faster than the Fuji and three stops faster than the DigiZoom. The Prime lenses were shot a second time with no ND, but stopped down to T/8 to check if the depth of field was similar to the Fuji and Zeiss zooms at equivalent focal lengths and equivalent T-stops. The DigiZoom is rated at T/1.9, but that light is spread out over a much larger sensor. I don’t know how much light is being sucked up by the adapter, and how much light loss is taken up by the magnification of the image circle, but taken together, you lose 3 stops, or perhaps a hair less. The T/1.8 Digizoom yielded the equivalent of a T/5.6 in terms of exposure. The Fujinon HD Zoom rated worse. Although it’s aperture ring is marked a 1.8, the doubler costs another stop or more. I exposed the Fuji zoom expecting a T/8, but in reality it was still slightly more than one stop darker than the DigiZoom, especially at the longer focal lengths. By about 30mm (150mm equivalent) you can see the image getting darker, and by the end of the zoom range at 59mm, it looks to be a full stop darker. So from these tests I’d have to say the HD Zooms are between T/8.5 and T/11.5, or slightly more than three stops and less than five. The basic multiplication factor is almost exactly 2.5x: a 6mm on the DigiZoom yields the same field of view as a 15mm prime, all the way up to 24mm, which is almost exactly like a 60mm prime. With the Fuji or Canon HD lenses it gets a bit trickier; you need to engage the doubler unless you want some really weird distortion in the corners plus some wicked vignetting. In this case, it’s 2.5x multiplied by a factor of 2 to take into consideration the doubler. So the 4.5-59mm Fuji I tested was about the equivalent of a 22.5mm-295mm zoom – a very long zoom for its size. The one piece of slightly false information out there about this adapter is the depth-of-field question. I had previously read that the adapter “preserves” the depth of field characteristics. That’s only true if you’re talking about the DoF characteristics of these lenses on a 2/3″ camera. The samples I’ve posted clearly show that putting B4 lenses on the HDx35 gives you about the same depth of field as a PL prime that is stopped down to give the equivalent exposure. So, the DigiZoom gives you an exposure of about T/5.6, and almost the exact same DoF as a prime set to T/5.6….very very deep depth of field. The Fuji HD zoom was similar – it gives about the same DoF as a the equivalent prime lenses stopped down to T/8. The HDx35 weighs almost nothing relative to the size of the Alexa. The camera balances nicely on the shoulder with a Fuji or Canon B4 zoom. Lightweight rails and handles plus a mattebox like the MMB-1 round out a fairly reasonable run-and-gun package. I’d say the power cable to run the zoom servo is a must, though, since the zoom and iris rings are pretty small and hard to grab on the fly. Using something like the Zeiss DigiZoom is another interesting option, although it makes the camera a bit front heavy and they don’t have quite the same zoom range. The advantage of the DigiZoom is that it will go wider and it’s at least one full stop more open, since it seems to cover the full frame without too much vignetting or softness in the corners. So you don’t need to engage the optical doubler…oh, wait, the DigiZooms don’t have one anyway. The DigiZoom was surprisingly sharp and contrasty. The corners exhibit some CA, as is to be expected with a lens that was only designed to cover a 2/3″ chip. I can’t fault this lens setup, although you wouldn’t want to use it for chroma key work or something like that. If you’re cropping to a 2.4:1 aspect ratio this zoom is fine. The Fuji looks brown and grainy to my eye. Dim, green and yucky. The challenge with this zoom is to get anything in focus, since the focus ring has such a short throw. The markings are totally inaccurate, and the turn from 3 meters to infinity is only about fifteen degrees. It just felt soft all-around. You can, however, still use the macro settings on the lens, which is kind of fun. You’re shooting outdoors, and you need VERY long lenses in a lightweight package. You’re on a tight budget and you need a couple of super-telephoto shots. It’s not such a big deal to cart around the adapter and an HD zoom compared to an Optimo 24-290. You’re shooting hand-held (again, outdoors) and need a very long zoom range. 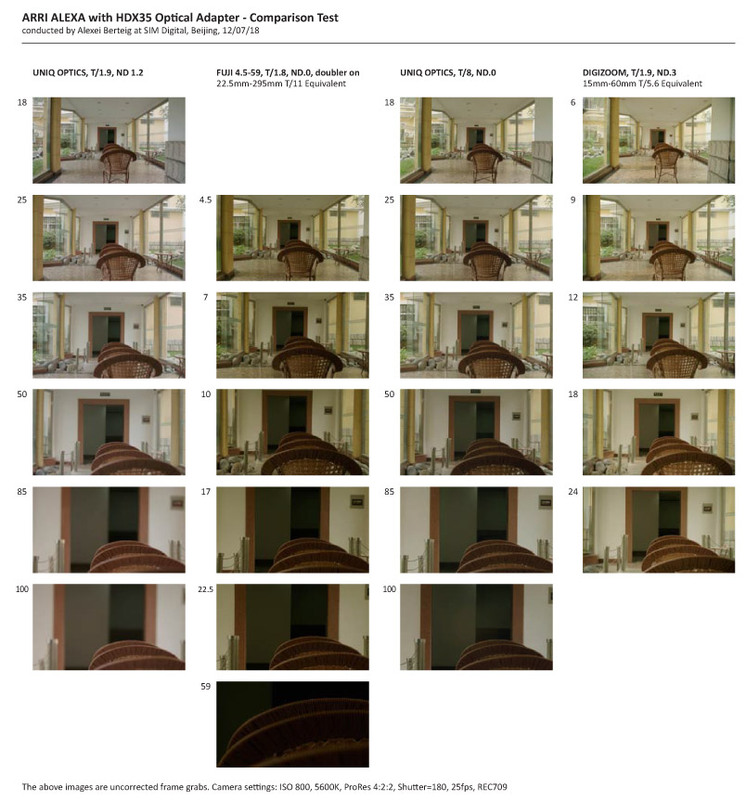 You want the dynamic range and color of an Alexa, and you don’t care about shallow depth-of-field. You have the absolute best quality B4 glass. You want shallow depth of field. You want the sharpest image possible. You have run-of-the mill “HD” B4 glass to stick on the front of your camera. Special Thanks: Forest Liu at Arri Beijing, Anson Mercado at SIM Digital Beijing. Hi, I was looking for this very type of review and impressed with the lengths you go through….. EXCEPT. Why did you enable to doubler?!! You say “you need to engage the doubler unless you want some really weird distortion in the corners plus some wicked vignetting” but this is absolutely not the case in my experience (F5, HDx35, and a variety of B4 Fuji/Canon Zooms). I may be wrong and would love to see the comparisons on or off, but I never encountered this and using the doubler will absolutely be critical in this review. Without it your B4 zooms will perform way better. I see you used the 4.5 which I didn’t try and is pretty wide. 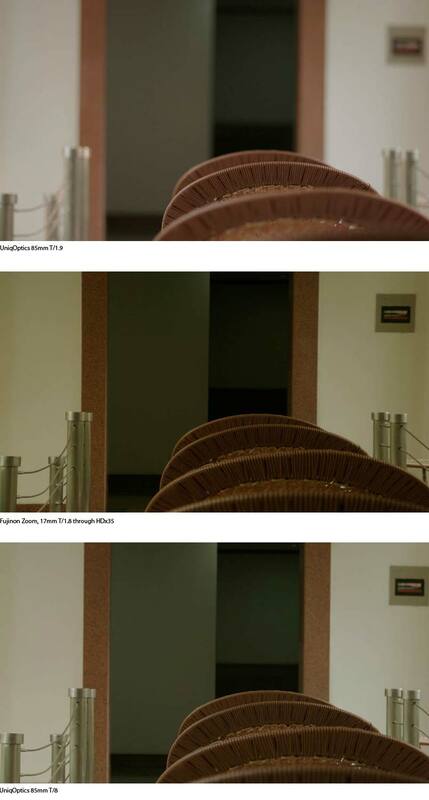 In your understanding do ~7.5mm lenses suffer from this supposed distortion and vignetting? Because I don’t see it. Even though some of my lenses have doublers I choose to never use them (99% of the time) because of loss in quality. So obviously I would never choose to use on with this doubler. If the 4.5 being super wide does have issue, than okay. But there are still a number of less wide zooms available that may perform much closer to your Digizoom. I certainly didn’t have the whole range of 2/3″ zooms at my disposal. And I guess “wicked vignetting” is a relative term. What the doubler does on these zooms is create a larger image circle coming out of the back element of the lens, which the HDx35 projects onto the even larger surface area of the S35 sensor. The Digizoom is like a lot of “Cine” lenses in that it creates a larger-than-necessary image circle in order to reduce vignetting, thus it was acceptable without a doubler on the HDx35. The particular Fuji lens I was using for the test, however, wasn’t just dark in the corners…it was black. If you’ve tested a range of 2/3″ lenses that work on the HDx35 without using the doubler, please list them so that anyone who stumbles across this article can see what other options are out there. Looks as an alternative while shooting exterior and need a very long zoom range. See documentary ENG. This combined with the 19-90mm Cabrio / T2.9 (ZK4.7×19)could be an alternative for lightweight production ENG work.